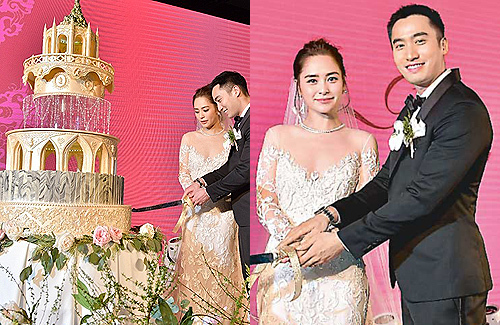 It has been a year full or marital celebrations for Gillian Chung (鍾欣潼) and her husband, Michael Lai (賴弘國). Although the couple held their wedding in Los Angeles in May of last year, they did not register their marriage in Hong Kong until yesterday. Today, the couple held a large banquet at the Ritz Carlton Hotel inviting many of Gillian’s friends in the entertainment industry. After the couple made their grand entrance, Gillian said on stage, “I’m very grateful to have met everyone who loves me.” Michael said to Gillian’s mother, “You can rest assured in handing your daughter to me.” However, Gillian’s boss, EEG founder Albert Yeung (楊受成) joked, “Don’t have a baby so soon. She can’t do much work while pregnant. She is one of the highest earning artistes at our company,” but Charlene Choi (蔡卓妍) replied that she would step in to help out with the work. The venue was decorated beautifully with an abundance of fresh flowers. Approximately 380 guests were invited. Mr. Yeung allegedly paid for the banquet, as well as a luxury home in Shanghai valued at 10 million yuan as gifts. 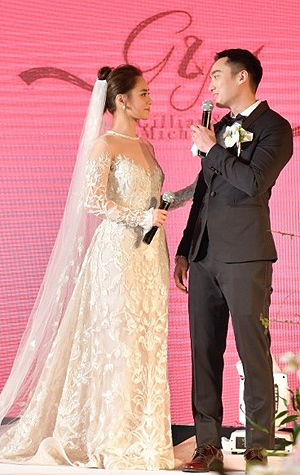 EEG also sponsored over $15 million HKD in the bride’s jewelry. Designed by Gillian, the towering wedding cake was a golden castle. Joey Yung (容祖兒) and Charlene paid $100,000 HKD for the cake as a gift to the bride. When Gillian met the press, she and her husband greeted them happily and even kissed shyly in front of cameras. Asked if Michael had anything special prepared, he answered, “I planned a small show and surprise for her, which I prepared for a while. When I have time, I would rehearse and have been prepping for a few weeks now.” Gillian believes that he will probably be singing and is just happy in general that she is celebrating with so many friends. For Gillian, the biggest transition since getting married is hearing people address her as Mrs. Lai. During the wedding, the couple were already addressing each other as husband and wife. In terms of Michael, when asked how many points he would give Gillian, he responded with a 100 and complimented on her beauty in Mandarin. Boy those bridesmaids dress are totally out of dated. I think they can wear something better than that. @cutie777 Yup, they looked too girlie and frilly or just unattractive. haha lol…..Sigh…with all that money and the looks are just not there. and $100,000 HKD for that cake? Their LA wedding was held in May 2018. We are still in 2018, so it’s not last year. Once these many wedding-related events of hers are over, I hope she can quietly settle down and mature. That Edison episode brought her to my attention. Somehow I get the impression since over the yrs; that this girl is so eager to be in relationships (unfortunately – many didn’t work out), and ‘romantically’ be in the limelight with those many relationships. Kinda like Joyce Tang – the one who was in that (unfortunate) LT relationship with Marcus Ngai. I feel she tries overly hard too.